Training camp is just around the corner for the Denver Nuggets and the 2018-19 NBA season is rapidly approaching. Denver has expectations at an all-time high and the talent to make this year into a special season, but who is going to step up to be the Nuggets Defensive Player of the Year? Who is going to be the player who carries the Nuggets bench unit? Is there a player who could have a breakout season? Who will be the Most Valuable Player on the roster? Those are the questions that the scribes at Mile High Sports came together to answer. Who will be the Nuggets Most Improved Player? T.J. McBride: If one member of the Nuggets’ core still has another leap in him, it is Jamal Murray. 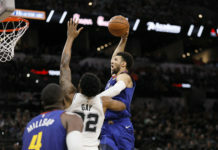 From his rookie season to his sophomore season, his three-point percentage went up 4.4 percent, his field-goal percentage jumped up by 4.7 percent, he scored 6.8 points more per game while also raising his assists, rebounds, steals, and free throw attempts per game as well. Even after so much improvement across the board, Murray is still just scratching the surface of his potential and is still just 21-years-old. He will be stepping into a bigger role in the 2018-19 season which puts him in a great position to continue to improve his numbers across the board once again and emerge as the Nuggets Most Improved Player. 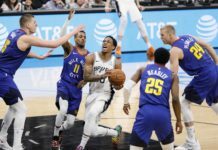 Dev Johnson: Barton was a Sixth Man of the Year candidate last year and he is now stepping into a starting role with the Nuggets which places him in the ideal spot to become the Nuggets Most Improved Player. Barton has progressed each season that he has been with the Nuggets and he is coming off of his most productive season yet. Last year, Barton averaged 15.7 points, five rebounds, and 4.1 assists in 33.1 minutes per game. He was Denver’s most versatile player as he split time between playing point guard, shooting guard and small forward. Now, Barton has to live up to his newly signed four-year contract worth $54 million, but this is what he has worked for his entire life. His presence with the starters will be felt from game one. 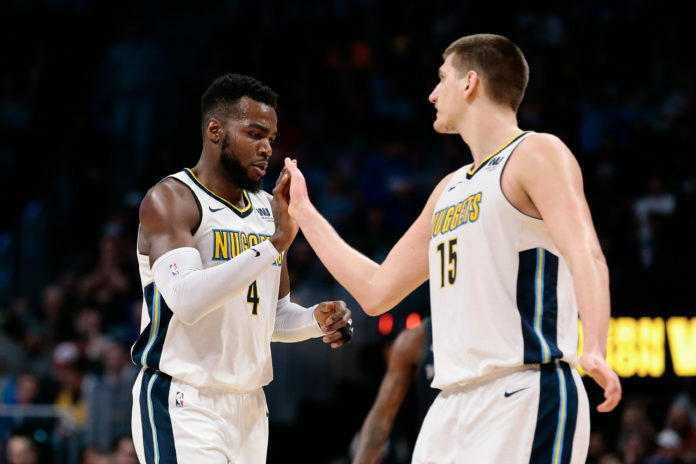 Brandon Ewing: This answer could go a number of directions as Gary Harris, Jamal Murray, and Nikola Jokic should get even better this season, but none of them has the opportunity Paul Millsap will get in 2018-19. After missing 44 games last season with a wrist injury, Millsap averaged just 14.6 points and 6.4 rebounds per game, with both marks being the lowest they’ve been since his 2009-10 season with the Utah Jazz. Millsap’s improvement won’t solely be based off his stats, but the fact that he will actually be on the court is what gives his selection merit. When Millsap was on the floor last season, the Nuggets posted offensive rating of 111.1 and a defensive rating at 107.1. The Nuggets went 22-16 in games played by Millsap last season, and that number should only go up with Millsap being healthier than last season. In what could be a make-or-break season for the Nuggets, Millsap is in line to have a big 2018-19 season. Who will be the Nuggets Defensive Player of the Year? T.J. McBride: Paul Millsap should be the consensus answer for Defensive Player of the Year. There is not a player on Nuggets’ roster who has the defensive IQ, versatility, hard-nosed approach, or love of defense like Millsap does. The Nuggets will get a large boost on the defensive end of the floor by having Millsap fully healthy and back on the floor for more than just 38 games. Dev Johnson: Millsap is the Nuggets’ best defender and it really isn’t close. The team suffered tremendously last year when he went down. He was brought in to address the Nuggets’ defensive issues and, without him on the floor, the defense regressed. In the games that Millsap did play in, he was his usual stubborn self on defense. He displayed that he is still a versatile defender that can switch onto smaller players and defend all five positions. While the defense wasn’t great last year, there were some small improvements made and that is without having Millsap for 44 games. With Millsap back to full health, there should be a major improvement on defense from last year. Brandon Ewing: The Nuggets Defensive Player of the Year is clearly Millsap. 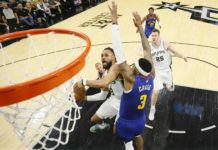 In the 38 games that Millsap played last season, he led the Nuggets to a defensive rating of 107.1 which would place the Nuggets as the 17th-best defense in the National Basketball Association. He also possess the ability to guard five positions. If the Nuggets can get at least 75 games out of Millsap next season, there’s no doubt he could be the Nuggets’ best defender. Who will be the Nuggets Sixth Man of the Year? T.J. McBride: Isaiah Thomas is the easy answer, but sources have told Mile High Sports that Thomas has still not participated in full contact activity which puts his availability for training camp and preseason in jeopardy. Because of that, my choice for Sixth Man of the Year is Trey Lyles. He has the skill set to step into a bigger role and become the focal point of the Nuggets’ bench unit. Lyles broke out last year and he finally began to show flashes of the player many hoped he could become. Now, his shooting, size, and ability to punish mismatches will be relied upon greatly off of the bench. Dev Johnson: The Nuggets’ Sixth Man of the Year should go to none other than Isaiah Thomas. While Thomas could play big minutes — if healthy and back to his usual self — he will not be a starter. Because of that, Thomas has a chance to not only be a Sixth Man of the Year candidate for the Nuggets, but also the NBA. He is an elite offensive player and will put up big numbers in Denver’s free flowing offense. If Thomas can get back to being his former self, he can provide scoring and leadership in spades. Thomas should be a critical part of the Nuggets’ success which would help him revive his career by becoming Denver’s Sixth Man of the Year. Brandon Ewing: This is Isaiah Thomas’ award to lose, not just on the Nuggets roster, but in the NBA. As I outlined in my piece just a month ago, Thomas can be the Nuggets missing bench piece which gives him a solid chance at becoming the Sixth Man of the Year of the NBA. Thomas will be tasked with running the Nuggets second unit and turning that unit into a weapon. After signing for the veteran minimum this offseason, Thomas comes in with something to prove and with a chip on his shoulder like never before. That hunger and passion will play big dividends in Thomas potentially being the Nuggets Sixth Man of the Year and proving the rest of the NBA wrong in the process. Who will be the Nuggets Most Valuable Player? T.J. McBride: This is a very simple answer. Nikola Jokic. Dev Johnson: Nikola Jokic came in at No. 12 on ESPN’s NBArank and is looking to move even higher after another big year. He is proving that he is one of the best players in the league and now he is starting to get the notoriety that he deserves. Jokic has improved his game each year and is coming off of his best season yet. He is the franchise player for the Nuggets and keeps finding ways to improve. This year Jokic should reach another level. He should increase his amount of triple doubles and the Nuggets to the playoffs — which means more wins and him getting more recognition on the national stage. This is a big year for the organization, but an even bigger year for Jokic after being given a max contract. Brandon Ewing: Nikola Jokic will be the Nuggets Most Valuable Player next season. After earning a five-year, $148 million max contract this offseason, Jokic is officially the cornerstone for the Nuggets franchise moving forward. He has improved statistically in each of his first three seasons, and next year should be no different. After averaging 18.5 points, 10.7 rebounds, and 6.1 assists last season, Jokic could take another step forward and continue to improve his averages this season. Jokic has the ability to lead the Nuggets in all there major categories once again and become the Nuggets Most Valuable Player. If everything goes right for the Nuggets this season, Jokic could potentially put his name on the National Basketball Association Most Valuable Player ballot by the end of the season.